In a village at the heart of the Pyrenées, 70km from Lourdes and just 50 metres from the cable cars, the Saint Lary Sensoria mountain hotel offers rooms with views of the peaks. Enjoy a relaxing time on the terrace in the centre of a garden giving onto t he mountain. Or enjoy a session in our Thermal Spa and Fitness Centre. This is a hotel which has stayed true to its Pyrenean roots, cultivating a genuine charm and welcoming service. At the heart of the Pyrénées, St-Lary-Soulan is a unique and unspoilt village where you will receive the warm welcome typical of French mountain life. The number one ski resort in the Pyrénées, accessible by two types of aerial tramway, a destination dedicated to ski lovers. Perfect for families in both summer and winter, the Mercure & Spa Sensoria is here to help you take advantage of all the many activities this unique area has to offer! Direct access to Spain via the Bielsa tunnel. 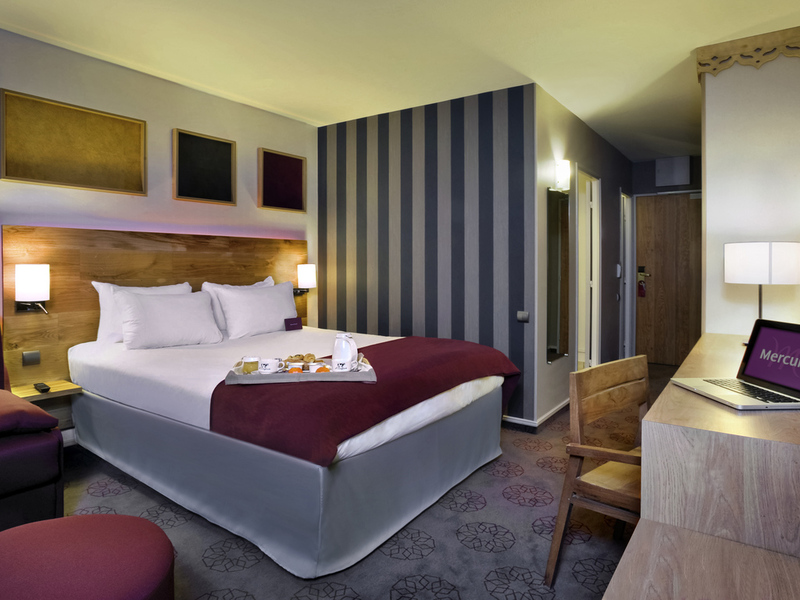 Enloy your stay in this Mercure hotel exploring the Pyrénees mountains and their rich natural, cultural and historic heritage. Right next to the Spanish border, this is an excellent sporting location in summer as well as winter. 65 enhanced-comfort rooms spread over three floors with balconies and views of the Pyrenees or the gardens. The kitchen is overseen by a chef who is able to create gourmet cuisine by combining haute cuisine and regional specialties with subtle Pyrenean flavors. The restaurant is a place for everyone to enjoy, designed as a refuge from the world. Whether it's for morning coffee, afternoon tea or an evening drink, take a moment to relax by the fire or on the terrace in the company of family or friends. Why not try a homemade snack, available throughout the day? Wonderful hotel, great location, excellent staff and superb food! We enjoyed four days at the St Lary. The hotel is well located within an easy walk of the main shopping streets. Fabulous views of the mountains and short walk to the gondola. All the staff were fantastic from check-in to departure. After long treks during the day, the spa was a welcome addition. The highlight for us was the food. Meals were obviously lovingly prepared, and every meal was very special. A superb hotel with great staff in the best location. From start to finish a really professional hotel. Very comfortable rooms and bed and a great restaurant. The stay was less than expected. Hotel is a bit basic for being rated 4 stars, food ok and spa was VERY disappointing and poor quality. Reconsider advertising a spa at your hotel location, as is false and not accurate. The spa environment is very poor and was the only reason we decided to book at your location. Ensure that the difference between access to the spa offered by the hotel and access to Rio is made clear, as the photos on your website are false advertising. Overall, quality for money is poor and would not recommend nor return to this location for the price paid. Extremely helpful and happy staff ! Lovely large bright room. Great location. I was there for an Ultra Trail Race ... the Grand Raid Des Pyrenees... so peace and quiet and good surroundings were important for preparation. I got exactly what I'd hoped for. Not sure though if I gave the staff my Le Club Accor rewards number .... on my card it gives the numbers 30… and 14… .... can the 4 nights stay in Saint Lary Soulan be added ? Thank you Mark R.
The staff went above and beyond to make sure our guests were happy. We are so grateful to all the effort they made throughout the entire weedkwnd. The staff in all regards were professional and friendly and so helpful. The reception staff accommodated easily a few special requests we had, such as late checkout, and looking for a walking stick,. The dining and food staff went out of their way to help us. We had a total disconnection from our city life and thank's to the wonderful team of Mercure St-Lary we spent a fine few days break. Very pertinent advice for the trekking areas as well as for the things to see and do around St-Lary. The breakfast was great and we were treated with exceptional customer care. Thank you Mercure St-Lary!